In 2012, Thierry Jamin embarks on an incredible journey in Machu Picchu. Indeed, Jamin and his team think that they have realize an extraordinary archaeological discovery in the lost city that has been made famous by Hiram Bingham in 1911. This discovery has been possible thanks to the testimony of a French engineer from Barcelona, David Crespy, who visited Machu Picchu in February 2010. At the beginning of the year 2013 several national media outlets start debating the discovery which soon becomes a national affair. Everything and anything is published! 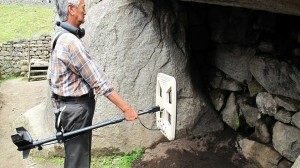 To allow the general public, politics and the scientific world to get a better idea about the discoveries realized at Machu Picchu by the Instituto Inkari – Cusco, Thierry Jamin and Hilbert Sumire Bustincio, project director, have then decided that all official documents regarding this case are now released publicly. Internet users will find on this web site all the written documents (official documents, etc. ), but also the main press articles (newspapers, magazines, etc. ), the main radio programs and the main reports and documentaries generated by the Peruvian and foreign medias about this incredible story. We tried to gather all the facts that will allow you to get the most objective possible vision about the case. Many documents and “technical reports” written by independent experts and official authorities are in our favor, others not. Use you own judgment and decide by yourself ! Do not hesitate to indicate us any document (written, audio or video) dealing with this topic that could be added to this website in order to enrich the debate. Thank you very much!